Hunting: The Axis are Real! My wife and I took a vacation over the long Labor Day weekend and headed up to Incline Village, Nevada for some R&R with her side of the family. A grand time was had by all, and by all rights I should have been ready to go back to work Wednesday morning. But I wasn’t. And I knew I wouldn’t be, because I’ve learned that the best course of action is to take a day off after you take a week off. So I packed up some guns that needed shooting and headed out to my ranch. But I kept my eyes peeled . . . If you’ll remember, I posted a few weeks back about my parents relentlessly badgering me, telling me about the Axis deer they kept seeing and how big the herd was, how tasty they would be this fall, and so on. To be honest, a part of me thought they were pulling my leg since Axis have always been a rare out near my parents’ place. So I kept my eyes peeled while I was driving around, and wouldn’t you know it — I finally saw them. I was driving down one of our roads headed back to my shooting area after a brief intermission due to some rain when I saw two axis does, pictured above. I actually had my Ruger M77 with me at the time, sighted in just that morning and loaded with 80 gr. Barnes TTSX. They were even standing broadside against that fence you see. But it was early September, it was hot, I was tired, and you shouldn’t ALWAYS take the first shot presented. So I opted to grab my camera instead and snap these two. But now the itch is verifiable and real. And soon the weather will chill out. Meat preservation will get easier and I’ll hopefully be able to post a recipe for chicken-fried Axis backstrap. Not to be anti hunter, but based on the older posts I can’t believe you would want to shoot something like that. Such a beautiful creature. Just an FYI, these were introduced in Texas in the early 30’s. They have become a very self sustaining species. Through conservation, (that means hunters govern themselves by being conservative in what they harvest), the herds have flourished. Similar to the Oryx in New Mexico, only better. Forgive my bias. I have yet to ever use a firearm to catch my own meal. I do want to try though. I highly recommend it, but your checkbook conservation definitely becomes a worry. And since I travel 2000 miles for my deer hunts, I take the 1st legal shot I get. Ha! Never pass on the first day, what you would be willing to take on the last day. It’s tasty and free meat, if they are on your land. Their skins make beautiful accessories, and their racks are spectacular. Also, their population needs to be controlled, just as the whitetail population does, or they destroy the habitat for themselves and other wild animals. They aren’t native, and they compete too well with the native wildlife. We sold a lot of ours to restaurants. I used to love waking up as a kid to the smell of venison on a Saturday or Sunday. My dad would be over the stove cooking away. Eggs, backstrap and hash browns. Dang, now I’m hungry. I’ve not hunted before, but the way you described the taste of axis in your previous posts makes me want to. Unfortunately in Indiana, I don’t think we have axis. And we still have a law on the books making it so we’re only allowed to use pistol calibers and shotguns for hunting. Pistol calibers and shotguns only? That makes all the sense in the world. The actual rules in Indiana are “Rifles with cartridges that fire a bullet of .357-inch diameter or larger; have a minimum case length of 1.16 inches; and have a maximum case length of 1.8 inches are legal to use only during the deer firearms and special antlerless seasons.” Pistols have a separate cartridge requirement too. It’s complicated. Sounds like there’s a whole grip of rifle cartridges that would be legal year-round then? Based on that description, everything smaller than .35 Whelen (measures .358) would be unregulated… As they would only meet 2 of 3 criteria for that regulation. I’m probably wrong. Its never that simple. But it should be. Proposed amendments to the rules include reducing the minimum diameter to .243 and removing the maximum case length. I don’t think it is that unusual in the Midwest. I think Ohio is shot gun and muzzleloader only, and I think Illinois has similar restrictions. I have no idea why. Maybe it has to do with population density (lots of small farms)? I own a farm in Illinois. Much of the state is as flat as a pool table. I think that may contribute to the reasoning behind the rule. I agree with Avid Reader. My in-laws are from Iowa, and they only have shotgun and muzzleloader seasons for most counties in the state. When I was driving through last weekend, I could see for miles, but the only good backstop in sight is the overpass of the interstate til you get to southern Iowa. Shotgun: 10-gauge or smaller shotgun using one ball or one rifled slug per barrel (rifled shotgun barrels are permitted when using shotgun slug ammunition). Shotguns cannot be capable of holding more than three shells. Handgun: with 5-inch minimum length barrel, using straight-walled cartridges .357 caliber or larger. Straight-walled cartridge rifles in the following calibers: .357 Magnum, .357 Maximum, .38 Special, .375 Super Magnum, .375 Winchester, .38-55, .41 Long Colt, .41 Magnum, .44 Special, .44 Magnum, .444 Marlin, .45 ACP, .45 Colt, .45 Long Colt, .45 Winchester Magnum, .45 Smith & Wesson, .454 Cassull, .460 Smith & Wesson, .45-70, .45-90, .45-110, .475 Linebaugh, .50-70, .50-90, .50-100, .50-110, and .500 Smith & Wesson. Shotguns and straight-walled cartridge rifles can be loaded with no more than three shells in the chamber and magazine combined. I could say that it bothers me that’ so few postees to this thread have ever had the desire or opportunity to actually feed themselves via their own resources. I could note that just because an animal sparks some maternal conditioning in an observer due to it’s large eyes and fuzzy pelt does not make it any more or less attractive than a steer or sheep or chicken but those words would not convey my intended message. Absolutely beautiful. I’m going to repeat that one. To my wife, every deer is “Bambi” She hates the thought of killing animals, but cooks pork often, as will as chicken, and beef, Go figure! Pre-butchered meat is quite a bit different than butchering a freshly killed animal. I don’t think your wife would take too well to wringing a chicken’s neck, removing the feathers and gutting it to make Sunday dinner. I’ve looked at enough beef sides and cuts diagrams in butcher shops to know I would have no idea where to begin with a whole cow. I guarantee that you’ll look at both meat and life with a very different outlook after the first time you’ve killed and eaten something. I feed myself every day. I hunt in the local grocery store. Do I know how to live off the land, of course, but I usually prefer what I can buy. Tyler, you fiend. A recipe shall do me no good at all without the makings, and the nearest Axis deer is smugly chewing his cud 1,700 miles beyond my longest rifle shot. If you were a girl, you know what we would call you. I love animals, but I love plants even more. The thought of these guys chewing up defenseless little flowers and baby trees tears me up inside. I hunt so that maybe that little oak tree will one day live to be big and strong. If anything I’m a vegetation rights activist. Too many deer do in fact destroy the plant life that other animals need to survive. 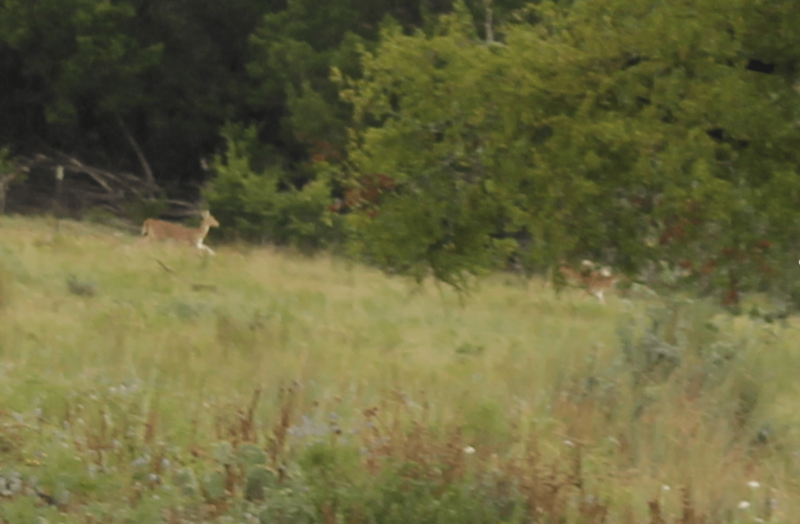 There is way too much herbivory on a lot of Texas ranches, due to too many whitetails and exotic deer. You can see the lines where all the browse has been eaten as high as the deer can reach. That’s when you know you’re past the point when you needed to do serious culling. I pretty much only eat vegetarians…..
My favorite way to end a debate with vegetarians is “yeah well my food poops on your food”. How do you tell if someone’s a vegan?